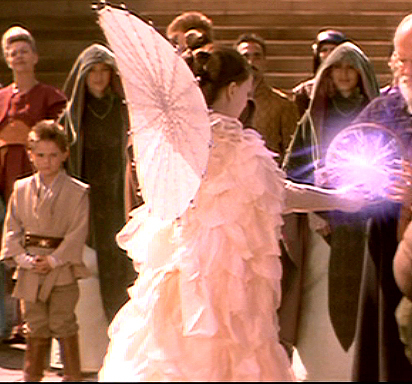 The Parade Handmaiden gown was seen on 4 handmaidens at the end of The Phantom Menace during the Naboo Celebration. It's unfortunate such a gorgeous gown doesn't have many appearances even in the extra materials or the Dressing the Galaxy book, but thankfully it was on display at FIDM. I got a far-away glimpse of this dress at the exhibit. My picture is the first. The net three are tiny captures from the film, and the last is a nice back shot taken by Sister Sola. [UNDERDRESS] - The Underdress is only seen as the skirt and the sleeves. The body of the dress is unknown. This is good, as you can either make a simple dress and just throw the ruffly sleeves on, or you can do whatever design you want, provided the sleeves and the skirt match the picture. I'm chosing to do a full design in case I'm at a con and want to take the cloak off. The sleeves look to have verticle ruffles or tucks. I found a sheer fabric with 1" sheer ruffles sewn on them. I haven't decided if I'm going to use this yet because I think it's a tad more ruffly than the real thing. I'll have to see. The skirt is an A shape with no extra fullness, it is a pretty straight line. I think to keep the shape like this, there would have to be some kind of petticoat underneath. I will be trying a simple quilted petticoat. The skirt is made with Silk Dupioni (the slubs will be going horizontal) and I am going to try ordering the Ice Green from Silk Baron and see if it's the right color. -edit 04/29/07- I got my Ice Green silk Dupioni from Silk Baron. It looks pretty good to me, like the movie color, maybe a tad more green, but it's very close... and if I take a pic without the flash, it looks celery green, like all the indoor shots of the costume, so I think that makes this color the right choice. I've made my muslin and have the complete pattern, and have the main body of the gown sewn together. I just need to worry about the top part, the sleeves, and finishing. 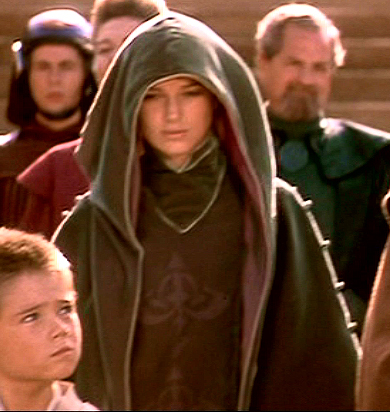 I am going to embroider a dark pink Naboo Symbol on the top as well. [CLOAK] This multi-layer cloak is made from Silk Velvet. 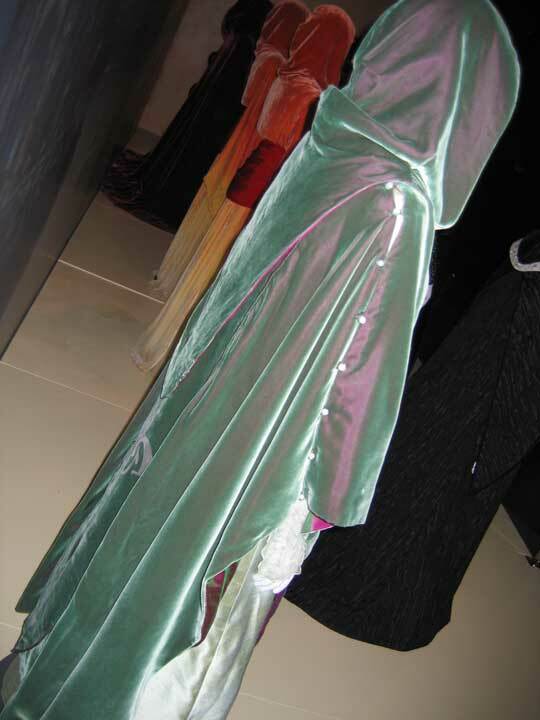 Silk velvet is made with a silk backing, and rayon pile. The way this was made, I believe, is that the backing is dyed a pink color, and the pile is dyed this nice green color. 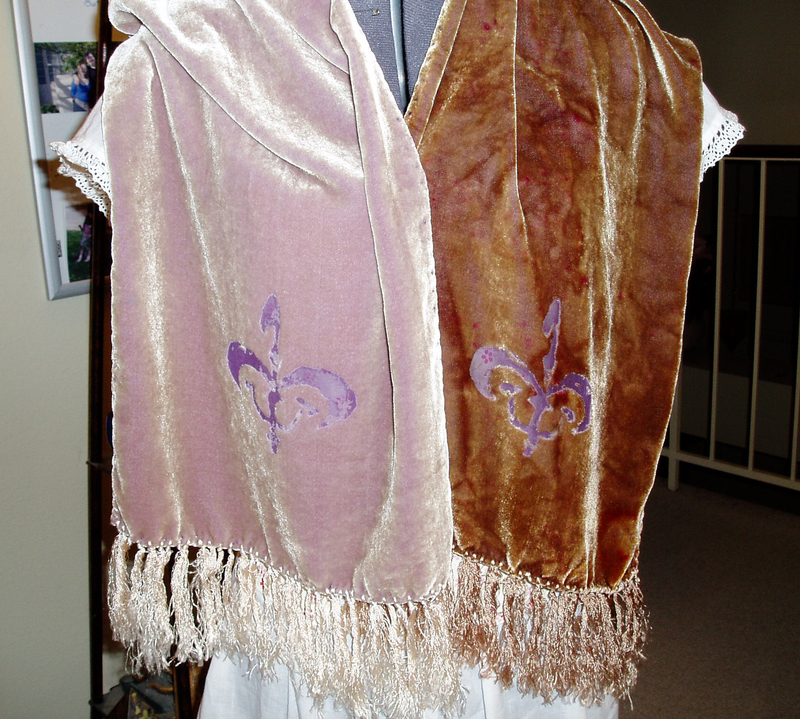 I do think the cloak is lined with a separate pink satin, but it has to have the two-tone method of dyeing. 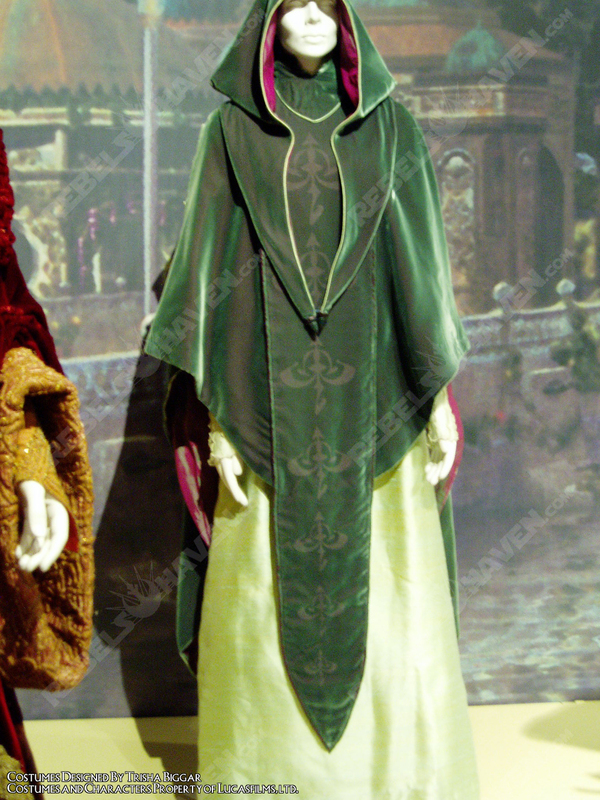 You'll note that in the last picture of the back of the gown, you can see a definite pink shine to the fabric, but in the movie, it just looks straight green. The flash is what makes the backing of the fabric show through. This picture shows my silk dying and devorè sample. On the left of the scarf, the pile is still white and the backing is purple. On the right side is the side I dyed the back purple and the pile a brown. The scarf looks brown in person, but with the flash you can see purple shining through, which proves this is the method used on this fabric. This cloak has a few layers. The main layer is attached at the side seams by buttons (either this is the closure, or the buttons are decorative and there's a hidden closure somewhere) There are matching banner panels draping down the front and back that has a high neckline, and is covered with the Naboo Symbol. Over the top of this is a hood, which extends down the back and down the front on each side, and is piped in an ivory color. The tips in the front have a small decoration, I don't know of what material, I just know it is a slightly pointy upside-down teardrop shape. 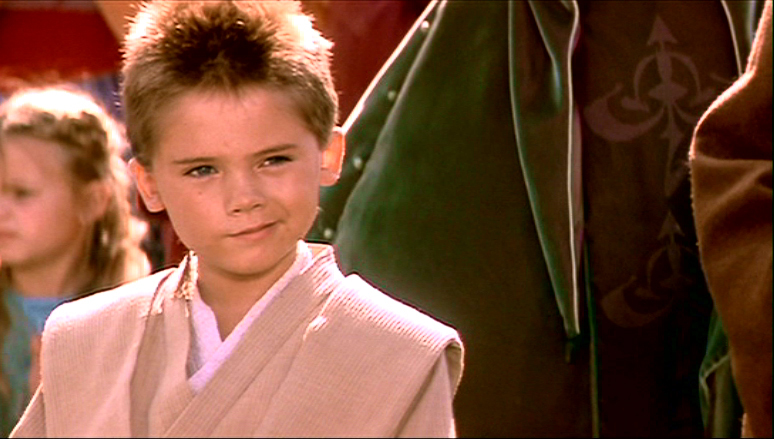 Regarding the symbols, above you will see my stencil I made of the Naboo Symbol. On the front of the Limited Edition shell that holds the Dressing the Galaxy book is an indented Naboo Symbol, which I made a rubbing of, scanned, and traced to make this stencil. Please feel free to use it, all I ask is that you link back here. Almost all/Every Padme or handmaiden costume has a version of this symbol in it somewhere. For this dress, it is this same symbol, except upside-down. There are two theories as to how the symbol is made for this costume. It is either devorè or embossing. After testing, I think it is embossed, but I'll list the methods here. I won't know until I do further testing in the right colors. [DEVORÈ vs. EMBOSSING] There are two possible ways to do this symbol. The first, and I believe the correct one, is embossing. If you see my first picture, you'll note the symbol seems the same color as the highlights of the cloak. I think this means the pile fibers are crushed down. To do this, you will need to get a blank piece of rubber stamp material or some other medium, and make the reverse shape of the symbol. Since the symbol varies in size, several would have to be made. You can do a test to see how this works with an rubber stamp. Place the stamp face up on your ironing board. Place a piece of velvet face down on top of the stamp. Over the back, place a slightly damp presscloth (a washcloth will do fine) Press a hot iron over it for probably about 5 seconds. Now the design is imprinted in the velvet. Devorè is a technique that burns out plant fibers out of a fabric, which means any fabric this technique is done on must be a mixed-fiber fabric. It is best known for making burnt-out velvet designs. Any velvet won't do, like the poly crap you find in JoAnns. You need silk-velvet, which has a silk backing and a rayon pile. To color your fabric, you will need a silk dye, which will have to be dyed in Hot Water. They will send you an instruction sheet with it. I'd suggest, if you want the lining to be in silk satin, you dye the velvet and the satin in the same batch so you get the same color. To dye the top, you will need a dye for plant fibers. The one they have for those fibers is discontinued, so I tried my sample with their fiber reactive dye. To dye silk, it must be hot water, so I dyed in cold water so it wouldn't color the backing, and it looks pretty successful. I haven't tried to dye velvet yet in the robe colors, so I will report back. I think the pink will have to be the hot fuschia with some red added so it's not too pink, and the green looks to be more on the blue side of the spectrum than the yellow, so I will try the Better Blue Green dye. All of the silk fabrics, dyes, and the Fiber Etch chemical can be found at DHARMA TRADING. They also sell the silk velvet scarves there that are good to do test-dyes on. I'm not sure if it matters if you dye the pile or the backing first. You can also get the Fiber Etch at SILKPAINT.com along with complete instructions on how to use it. It's pretty simple. You can get blank plastic template material at JoAnns, and can blow up and print out different sizes of the Naboo Symbol (remember, upside-down for this one). Basically, trace out your design with chalk on top of the velvet. Get a bottle with a slender tip to it for your fiber etch. Fill in your design slowly (make sure not to go outside the lines!) You will need to kind of scratch in the gel with the tip to get it all the way to the bottom of the fabric. In my test I seem to have missed a few spots. You will need to use enough gel that if you look on the backside it saturates through. Let dry. Don't worry if your fabric looks discolored where the gel is. My purple looked bright pink, but as soon as the final step was completed, it wasn't discolored at all. Once dry, stick it in a hot dryer, testing every 5-10 mins. It shoudl be hard and crunchy and scratch off easy with your fingernail. If it isn't like this after an hour, you will need to use an iron. Mine was activated after half an hour. Don't overheat, and don't leave the gel on longer than necessary. Run it under water and scratch the pile off with your fingernail. Wash with mild detergent and dry. You're done! My sample is above, one with no color to the pile, and one with brown. I don't think this is the method used for this because the design would be vibrant pink but it's not, so I think it's embossed, but we'll see after I do a test in the real colors. This is the method used for several other outfits in the movie, such as the red handmaiden cloak.